Salt has been mined at Hallstatt since the Bronze Age, including for the preservation of pork meat. 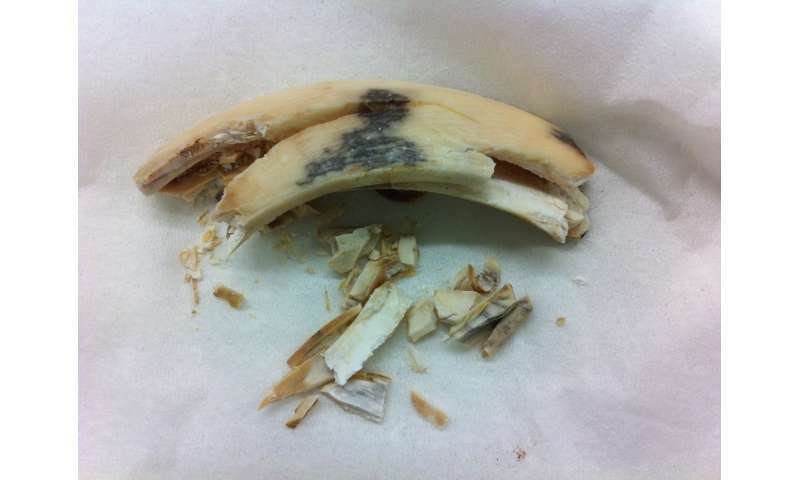 Bone fragments and teeth found in the area provide evidence of an organized meat industry, especially of pork. Residual DNA in these prehistoric specimens can reveal information about the genetic origins of the pigs. Using a specially developed method, researchers from Vetmeduni Vienna and the Vienna Natural History Museum extracted and analysed the prehistoric DNA. Their study, published in BMC Research Notes, shows that the Bronze Age Hallstatt pigs were genetically European. The Hallstatt region is an internationally renowned World Heritage site. But the real treasure here is – and has been since the Bronze Age – the salt that is extracted in the mines near the town. One reason is that Hallstatt salt is ideal for the preservation of meat without the usual refrigeration. Because of this, a lucrative meat production industry developed in the region quite early. The Bronze Age inhabitants of Hallstatt had pigs – but what kind of pigs? Excavations as well as bone fragments and teeth attest especially to the presence of pork meat production in the Hallstatt region during the Bronze Age. Genetic information obtained from these specimens makes it is possible to more exactly date the visual evidence. The specimens often contain enough residual DNA to identify the exact species of pigs that were processed here. But extracting prehistoric DNA requires special methods to be used. Sabine Hammer from the Institute of Immunology at Vetmeduni Vienna and her colleagues at the Natural History Museum managed to extract mitochondrial DNA from porcine teeth as a first step to identifying the species of pigs that were processed at Hallstatt during the Bronze Age. The analysis showed that the collected samples belong almost exclusively to the so-called European haplogroup. Visually determining and dating a species based on bone fragments or teeth is no longer the only way to identify archaeological samples. The determination of the genetic and, consequently, geographic origins provides valuable information about the keeping or breeding of livestock in early human history. What is needed is a source of prehistoric DNA of sufficient quality to be extracted and analysed. Hammer and her colleagues managed to adapt the available approaches in order to genetically determine the first samples. "We were able to extract enough mitochondrial DNA for a so-called marker analysis from seven of the chosen samples," the first author explains. "We performed a computer analysis to compare the DNA sequences decoded in this manner with previously published DNA codes. The result was clear for all of the samples except one. It appears that only pigs that belong, genetically seen, to the European ancestors were processed." Modern pigs can be placed into one of two haplogroups in which certain genetic variations can be traced through evolution to a common ancestor. "Pigs can be divided into an Asian and a European haplogroup," explains Hammer. "Our findings showed six of the samples to be clearly of European origin." Just one sample revealed an intermediate haplotype between the two groups. "These findings are a first step towards showing that pigs for meat production were kept and bred in and around Hallstatt," explains Hammer. This geographic assumption must still be confirmed through additional sampling. It appears clear, however, that not only the farmed animals but also wild boars that were hunted for the early Hallstatt meat industry had European ancestors. The specially developed method, confirmed by the results of this study, will help to decode additional marker genes for a more comprehensive analysis in the future. "The important thing, however, is that DNA of sufficient quality must be extracted from the excavated samples," says Hammer. Only then will it be possible to clearly map out and geographically assign the specimens.